As far back as I can remember, I've always been a sucker for a good time-travel story. If the time travel is wrapped around a convincing romance, even better. Literary standouts of the genre include Time and Again, Bid Time Return (which became the movie Somewhere In Time), and The Time Traveler's Wife. Movie-wise you've got Time After Time, 12 Monkeys, the obscure but great 12:01, and last year's Safety Not Guaranteed. On TV the grandaddy of them all was the first-season Star Trek episode, "The City on the Edge of Forever," written by Harlan Ellison and considered among the best Trek episodes ever made (of any generation). Brad Anderson's Happy Accidents (2000) juggles elements from many of its predecessors yet manages, in its grounded, low-budget way, to make an impressive contribution to the time-travel-romance. You can tell this movie--written, directed, and edited by Anderson--was made with far more love than money. It's sci-fi of the mind, with nary a special effect to be seen. Imagine (if you will) a feature-length episode of The Twilight Zone, only shot in a realistic New York setting with quirky humor and bucketloads of heart. 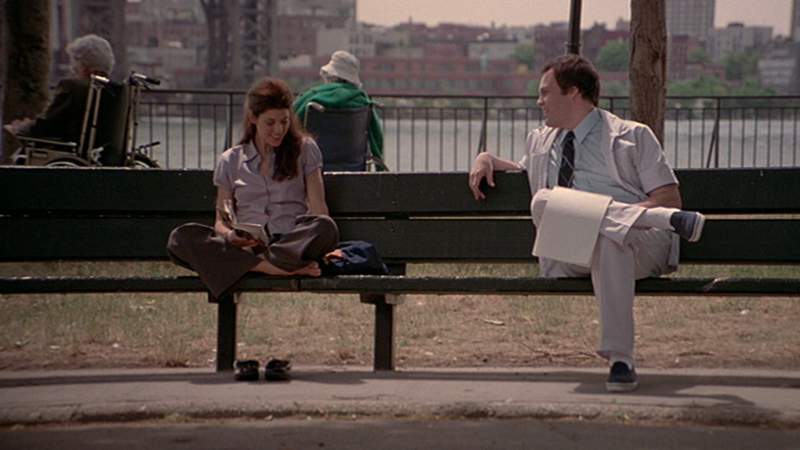 The heart--or hearts, in this case--belong to Marisa Tomei's loveburned Ruby and Vincent D'Onofrio's oddball Sam. They meet on a park bench and, after some unconventional courting by Sam, are soon living together. Sure, Sam has some strange behavioral tics and seems to be from further away than his professed hometown of Dubuque, Iowa, but Ruby can't deny he's the nicest guy she's dated after a succession of damaged losers. So she straps herself in and tries to enjoy the ride. But we know this won't last, since the movie opens with Ruby at the end of her rope, telling her therapist about an unspecified crisis with Sam. Much of the rest of the film comes in flashbacks as Ruby brings her therapist (and us) up to date on what turned her into the tearstained mess she's become. These opening minutes suggest a self-conscious indie romance with jaded thirtysomething women bitching about the paucity of good men (much like Anderson's earlier--and quite charming--Next Stop, Wonderland). But this is only setting up the movie's ground rules while planting seeds for events to come. It's momentary but necessary. Weaned as we've been on countless movies and TV shows with fantastic premises, we don't think twice about believing a character who says he's from another planet or another time. After all, why bother to make the film if the guy's just a loony? How depressing is that? But if you loved someone in real life, someone you trusted and thought you knew well, and that person one day told you they were from over 400 years in the future, how would you react? The truth is, no matter how many movies you've seen or books you've read--or how big a sci-fi nut you are--you're going to get a sick feeling in your gut and know without a doubt that your loved one is, in fact, nuts. Or else on serious drugs. Because reality doesn't have the same rules as movies. So the problem in telling this kind of story becomes, how do you confuse the audience's expectations and make them forget a lifetime of cinematic conditioning? The most effective way is to mix genres. Start with, say, a documentary or found-footage format, then introduce aliens (District 9). Or monsters (Cloverfield). Or superheroes (Chronicle). Or in the case of Happy Accidents, set the table for an urban indie romance, with all its ramshackle charm and wisecracking sidekicks, then serve up an eccentric love interest who claims to be a time traveler. Presto--reality bent. With Marisa Tomei's earthbound beauty and Vincent D'Onofrio's awkward, everyguy charm, you can't help but feel invested in their otherwise very real relationship. You know it's a movie and you want to believe the guy's story, but every stylistic cue tells you this is a romantic comedy--and there are no time travelers in romantic comedies. Which means Sam must be crazy. Right? Since we only have his word that he's from the future--and there's no evidence via the usual sci-fi trappings--like Ruby we can't help but have our doubts. Safety Not Guaranteed posed a similar dilemma, if with a more comic emphasis. Considering that science fiction isn't usually known for its psychological or emotional depth, the level of both in Happy Accidents--along with a pleasantly offbeat sense of humor--lends the film a realism and warmth that allow it to exist as solely a love story. But that also gives the potential fantasy element a necessary weight. Is Sam crazy? For both his sake and Ruby's, we truly hope he's not. NOTE: Sad to say, this title expired on 7/8/14. If you're considering purchasing the DVD, please support this site by using the link below. Thanks. Thanks, Sam. Glad you liked the film.